This bowl has three characters, the name Wu Mingzhi, moulded onto three leaves, faintly visible. Such ‘signatures’ are extremely rare on Chinese ceramics. It is therefore not clear whether this would be the name of the maker or of a patron. 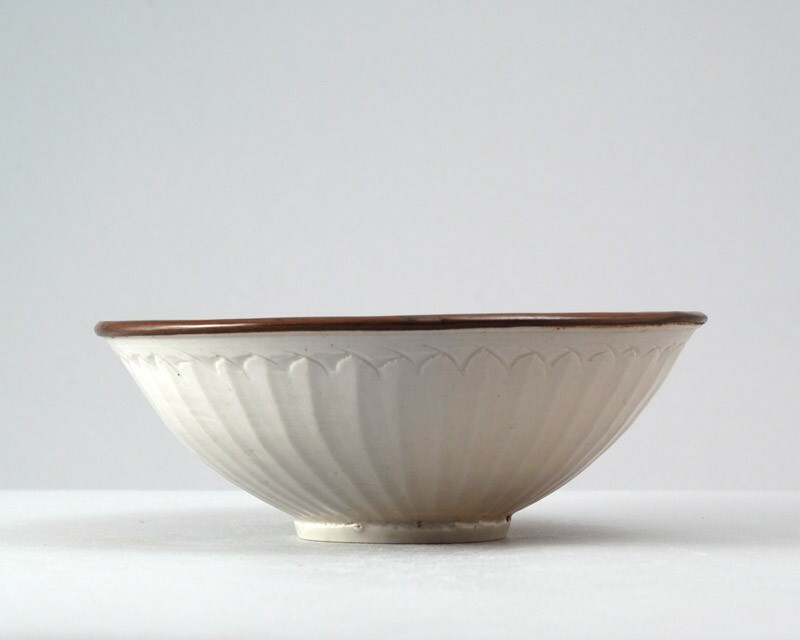 The rounded conical bowl has a thin straight foot and is slightly flared at the rim. The centre inside is clearly indicated and indistinctly moulded with a floral motif, the sides with a peony scroll with a multitude of flowers and leaves, evenly filling the space but leaving a band at the rim plain. The outside is carved with simple petals with pointed tips. The translucent glaze has a faint blue tinge and fully covers foot and base but leaves the rim free, which has been covered by a copper band.